Slept till about 7:30 and cleared out of Arles early – about 8:30. Drove to Les Baux – a mountaintop dead city where everything had been carved from rock – including houses. The wind on top was blowing at around 40-50 mph. Combine that with the lack of guardrails on cliffs and it’s a wonder that someone doesn’t die there every day. We got there before the busses, as usual, and I had fun climbing the rocks and stairs. Nice views. 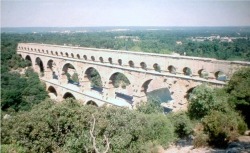 After Glanum we went to the Pont du Gard, a 2000 year old Roman aqueduct that rises 160+ feet over the Gard river in multiple levels. You can walk across it on all levels, including inside the watercourse. Pretty cool. We went over on one level and came back on another. We ate our picnic beforehand from the river level below. Bought the picnic outside Glanum and had cheese on baguettes (as usual) plus proscuitto-type ham. We picked out a hotel in the Gault Millau that was out of town and had pool, view, and restaurant. It took a while to find it, but we did and now we’re here – the St. Paul Hotel outside Viens. The pool’s really nice, if a bit cold. The room is ok. We expected a little more luxury, but for $55, who’s complaining? It’s adequate and comfortable, with a view of the valley. The hotel is stone and could be 10 or 150 years old. We had dinner, which was very disappointing. Good thing we only got the 3 course. The salad was good, but the rest not very good. Thought we were in England. Slept from 11 – 9 a.m. though, due to the quiet.